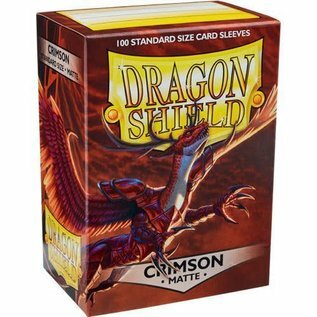 Protect your cards in style with Dragon Shield Standard 100 Count Sleeves! Whether you’re participating in a high-caliber tournament or just playing for fun with your friends, you’ll want to keep your cards protected from liquids, stains, and chafed edges.Each of these polypropylene sleeves measures 2.64 by 3.58 inches, making them the perfect size to protect your LCG® and CCG sized cards! Each box design fits 75 sleeved cards for durable transportation. Details: • For standard size cards measuring up to 63 x 88mm (2.5" x 3.5") • Clear front with opaque back. • 120 micron polypropylene. • Acid free. • Archival safe.